Since 1974, Six Flags Great Adventure has been a source of excitement, thrill, and invigoration. About 3.5 million people visit Great Adventure annually, making it the most attended amusement park in the world. On Wednesday, May 24, the class of 2018 helped bolster this statistic with a memorable experience filled with great adventure. Christian Sztolcman, John O’Rourke, and Sebastian Posillico experience the high speed of Kingda Ka, the world’s tallest steel roller coaster. An early morning rain shower left the juniors worried, but it failed to dampen their enthusiasm. As the students arrived to school, the building was filled with a sense of anticipation. Just after the morning announcements, the students boarded the coach buses and were on their way. The hour and a half bus ride to Jackson Township, New Jersey helped the juniors get into the proper mindset for the day. The rain earlier in the day proved to be a surprising bonus for the juniors; the park was less crowded than usual. 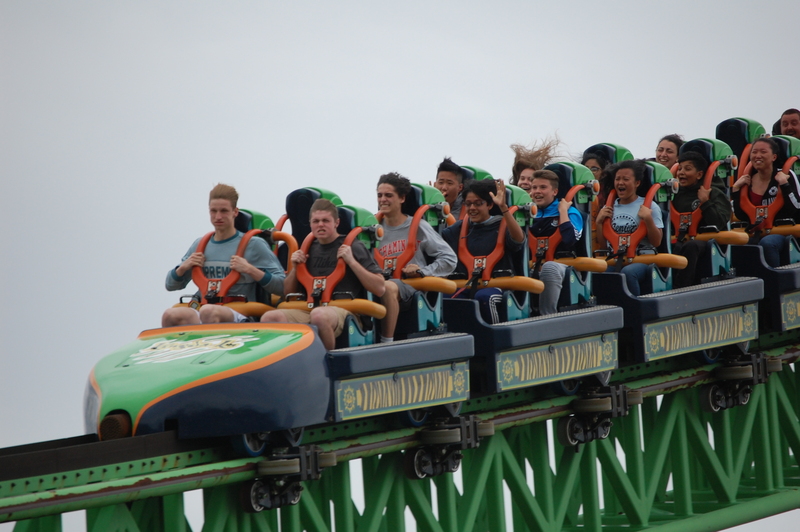 The smaller crowd allowed the juniors to enjoy Great Adventure’s intimidating roller coasters like Kingda Ka, the world’s tallest steel roller coaster, and thrill rides inspired by DC Comics characters: Batman, Superman, Green Lantern, Joker, and Bizzaro. Juniors James Lynn, Kevin Maguire, Liam Morse, Robert Scala Jack, Golden, and Michael Zuschlag get together for a group picture. Chaminade juniors took the park by storm, hopping on the lines of almost every attraction. For about five hours, students were able to roam the park with their fellow classmates and choose what rides they wanted to go on. Nick Faber ‘18 remarked, “I had a lot of fun. The waits were very short and there were tons of really good rides.” Juniors were also provided with a voucher for lunch, redeemable at the eateries around the park. For dinner, the juniors then gathered in the large picnic area where they were offered a buffet style meal. After a long day of play, the juniors finished up their meals and trekked to the buses. The drive back to Chaminade was radically different from the ride in the morning; after discussing the day for a short while, many of juniors slept on the way home, exhausted from the day’s activities. 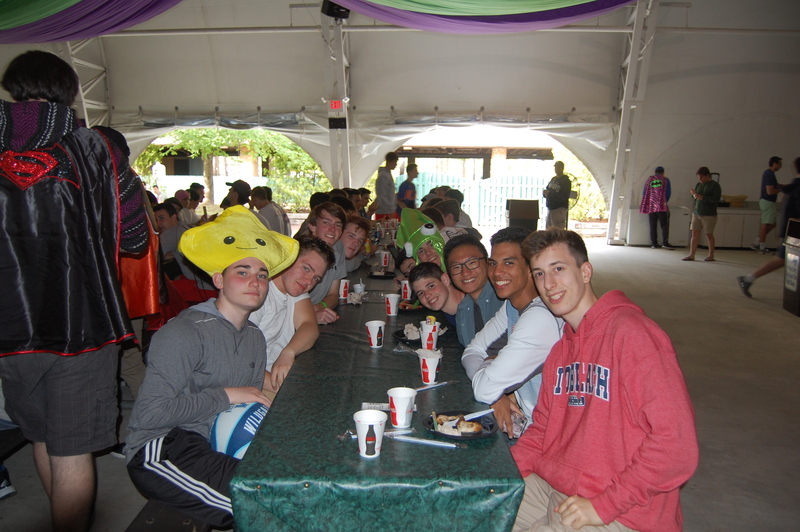 Juniors gathered in the picnic area to enjoy dinner together at the end of the day. This trip to Great Adventure served as a nice break from the stresses of school. As James Moran ‘18 said, “It was a great time. We got to bond with our classmates, and it gave us time to relax and have fun before comps.” Under the coordination of Mr. Brian Anselmo ‘89, and assistance from several faculty members, the juniors were able to enjoy a day set aside for relaxation and camaraderie. 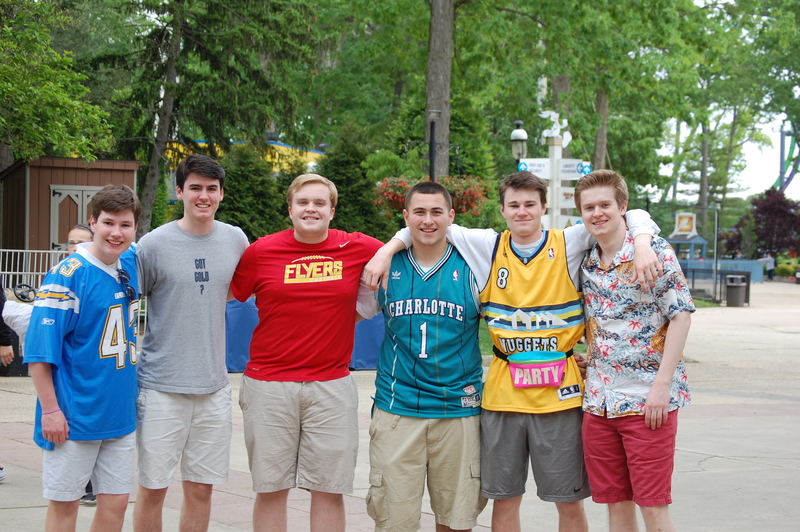 The class of 2018 now approaches the end of junior year, and the trip to Great Adventure marked the beginning of the home stretch as they cruise on into the summer. Posted in News and tagged six flags. Bookmark the permalink.